When I was twelve years old, my father took my brother and me on a weekend hunting trip to Elliott’s Island, Maryland. My dad was not a hunter, but many of his friends were. I will never forget the proprietor of what was later named the Mertle Gray Gunning Club, Sam Kenney, telling us that whatever we shot, we ate. Pete Malloy cooked us muskrat and wild duck for dinner that evening. The older gentlemen at Elliott’s were kind enough to take us duck hunting that season; it was then that I first placed my hands on a decoy, and I remember thinking there was something special about it. That feeling has never left me. As an undergraduate, I was a history major. Specifically, I enjoyed Maryland history. When I attended law school in South Dakota, many of my classmates grew tired of my constant references to Maryland’s history in my explanation of legal theories during and after class. The same held true while on active duty in the United States Navy, Judge Advocate General Corps. I was often accused of being somewhat conceited when it came to my Maryland roots. Oh well. My collecting reflects that same identity: my collections consist only of pieces of memorabilia related to Maryland’s history, which include, for example, Preakness glasses, Baltimore and Cumberland cone top beer cans, trains, oyster cans, Baltimore-made guns, and, of course, antique decoys. Living in Cecil County, Maryland, I have fine-tuned my decoy collecting to those birds carved only in this great county. As any serious decoy collector will tell you, once you get involved in your collection and hold an old decoy in your hands, you start wondering about what action that particular bird might have seen over the years. 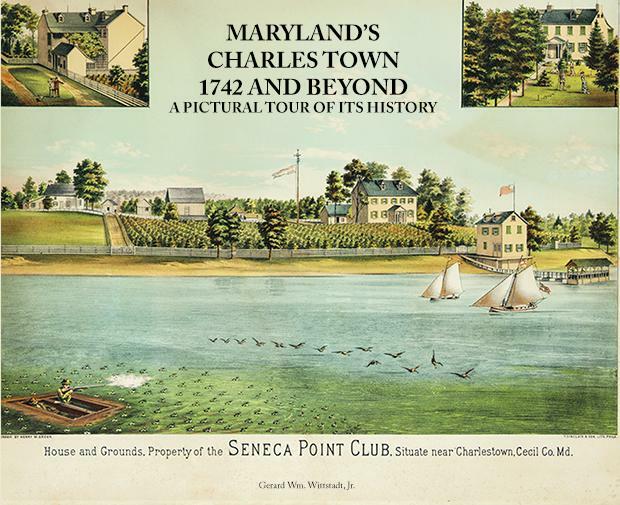 My historical quest quickly led me to the quiet little village of Charles Town. It was not long before my interest in the Charlestown carvers led to research into the town’s fascinating colonial heritage. In speaking with the residents of Charlestown, I learned that decoys and gunning were as much a part of the town’s history as the town’s colonial hero, Lieutenant Colonel Nathaniel Ramsay. I found several articles about the early colonial history of Charlestown and several references, in sporting magazines and decoy-collecting books, to the town’s decoy carvers, but there was a void where the two topics intersect. I do not consider this book to be, by any means, an academic work, nor do I consider it to be a "decoy book." Rather, it is my attempt to simply introduce this little town to those who might care, and to provoke an argument with our neighbors in Harford County about where the first decoy capital of the world was located. I would like to publicly thank several people for their kindness and assistance in helping me put this book together over the past eighteen months. First, however, I would like to thank the octogenarians of Charlestown. Without you and the members of your families who have gone before you, there would be no town for me and others to enjoy. You have truly preserved a treasure, and your work is to be commended. It is my hope that the younger generations of Charlestown residents appreciate the special place that you have called home. I would also like to thank Allen W. Purner Sr., who was the first person I contacted with the idea of putting this book together. When I called Mr. Purner he immediately invited me into his home, opened his books and records, and provided me with unparalleled support throughout this project. I would also like to thank J. Edgar McMullen and J. Cranford Henry for allowing me to reproduce their families’ photographs and for their keen sense of history. Thanks also to Colonial Charlestown, Inc.; to Rebecca Phillips, Darlene McCall, and Ruth Patchell Wright. Of course, I must also thank my loving wife, Lynn; without her love and support, I would be lost. I love you, always.